City letter denying freedom of information request from Farmers' Market stallholders association. 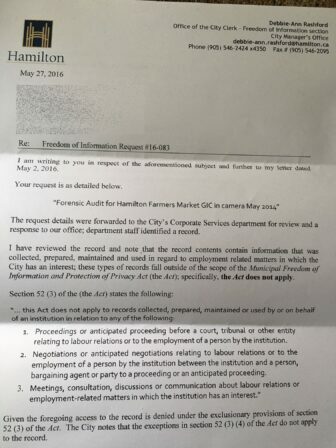 The City of Hamilton’s freedom of information office – rated worst municipal office in Canada – is claiming the forensic audit of resulting from a $1-million plus fraud discovered in 2013 is exempt from freedom of information. City letter denying freedom of information request from Farmers’ Market stallholders association. City manager Chris Murray’s office claims the audit is exempt from freedom of information as a “meetings, consultation, discussions or communication about labour relations or employment-related matters in which the institution has an interest”. Section 52(3) of the Municipal Freedom of Information and Protection of Privacy Act exempts most personal, employment, and labour records from disclosure for primarily privacy reasons. The City is claiming the forensic audit falls under this protection and denied access to the Hamilton Farmers’ Market Stallholders Association which filed the request. Since 2013, the City has been coy and evasive about the fraud, avoiding answers on how the $1,052,235.20 fraud was committed, where the missing money was stolen from, and how the City lacked financial controls that allowed for so much money to disappear over a couple of years. The City claims the fraud was committed solely by one employee, it occurred over the course of several years, and the employee was fired. The market stallholders can appeal the City’s claim that the forensic audit is exempt from access to information. 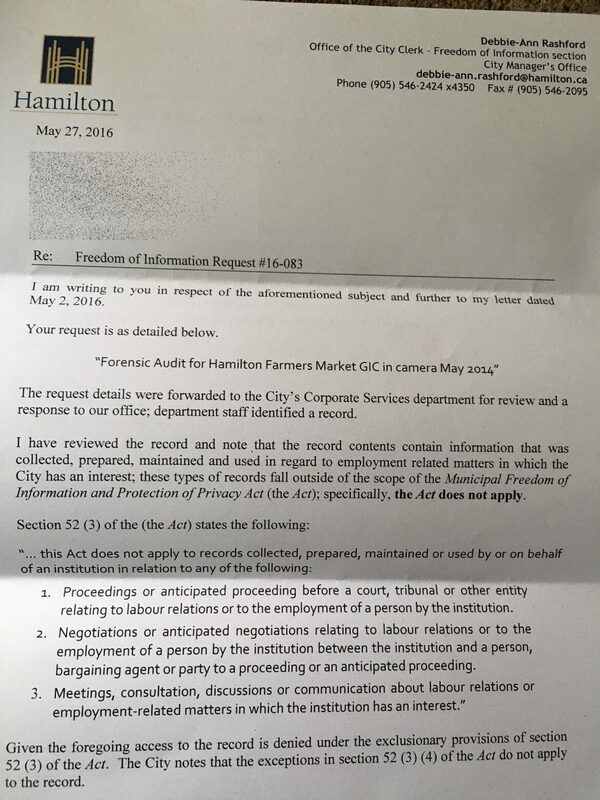 The challenge is that the process is lengthy, costly, and the City of Hamilton stretches out freedom of information battles. The reality is that very few organizations have the ability to fight the commitment of the City to blocking the release of information, with a nearly $2-billion dollar annual budget, the City is easily able to outspend and wait out all but the best resourced of freedom of information filers. Much as in 2013, we are still without answers in 2016. It doesn’t look like we’ll ever get the truth over how the money was stolen.